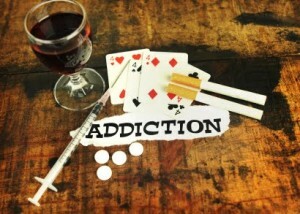 Addiction, a bad habit or disease? Addiction can be found in almost every corner of the world. Many people feel as though addiction strictly relates to something as serious as heroin or cocaine. However, addiction has no limits and covers more than just drugs and alcohol. People are addicted to things as detrimental as heroin and as harmless buying lottery tickets. According to the American Psychiatric Association, addiction must meet one of the following three criteria: tolerance, withdrawal, limited control, negative consequences, neglected or postponed activities, significant time or energy spent, and the desire to cut down. If a person meets three of the previously stated criteria, they are dealing with an problem that can tear someone apart. Everyone knows addiction is everywhere, but just how common is it? Around 10% of population is addicted to drugs or alcohol. That is higher than the rate of diabetes, which only impacts approximately 7% of the population. However, the ultimate question doctors and scientists have been testing is how exactly do we become addicted? One main question that scientists have been trying to figure out is whether or not addiction is caused by genetics. In one study, 861 identical twins and 653 fraternal twins were tested on whether or not genetics had an affect on the chances of addiction. The study found that if one of the identical twins was addicted to alcohol, the other twin had a significantly higher chance of becoming addicted as well. The fraternal twins did not have the same effect. If one of the twins was a addicted to alcohol it did not directly correlate with the other twin being a addicted. The study concluded that 50-60% of addiction relates to genetics. Another important piece of evidence supporting the genetic relation to addiction comes from a study on 231 people who faced drug or alcohol addiction and 61 people who did not have an addiction. The study was based around first degree relatives such as parents. It found that if people who were facing addiction had a first degree relative who dealt with similar problems, they had eight times greater of a chance than those who did not. An important thing to note is that although 50-60% of the chances of addiction are genetic, scientists have found that the remaining chance comes down to coping skills. This is the part where a person can take control and beat the addiction, whether it be genetically driven or not. Overall, I’ve found that addiction is as similar to diseases such as diabetes and cancer. Both of those two diseases are can be affected by your genetic makeup as well as life style choices. For example in diabetes, genetics is a factor impacting the chances of you getting it. However, healthy diet and exercise can also affect the chances of you getting the disease. The same goes for cancer. Many face inevitable “genetic predisposition” of cancer but we also know that things such as smoking can also contribute to your chances of developing the disease. Addiction is no different. Genetics do make up a portion of the chances of you getting the disease but it also comes down to lifestyle choices. I feel as though instead of treating the disease as a bad habit, we should treat it as a regular disease. This entry was posted in Uncategorized on October 21, 2015 by James Joseph Burke. I really enjoyed reading this post. I agree that addiction is partially genetic and the rest is based on life choices. On the other, I have a discrepancy with the title of the blog and saying “bad” habit which implies that all addictions are bad. I believe that their are such things as positive addictions. For example, one can be addicted to positive behaviors which in turn develops the character and the body to overcome negative addictions, and leads one to a rewarding life. Here’s an article which also reiterates this information. Overall, this post was interesting. I have to agree that addiction is a disease and does deal with your genetic makeup. I like how in the beginning you addressed that addiction is not just in terms with alcohol and other drugs but pretty much anything; shopping, gambling, you name it. You don’t have to be addicted to just objects, but you can be addicted to doing certain actions as well. I’m not sure if you have ever heard of the television show on TLC “My Strange Addiction” but this show clearly shows all the different types of addiction out in the world (and some are REALLY strange!) Here is a videothat I found from one of the episodes, just to give you and others reading this an idea of how serious of a problem addiction is, and how people can become addicted to the most random of things.